The folded normal distribution is a probability distribution related to the normal distribution. Given a normally distributed random variable X with mean μ and variance σ2, the random variable Y = |X| has a folded normal distribution. Such a case may be encountered if only the magnitude of some variable is recorded, but not its sign. The distribution is called Folded because probability mass to the left of the x = 0 is "folded" over by taking the absolute value. In the physics of heat conduction, the folded normal distribution is a fundamental solution of the heat equation on the upper plane (i.e. a heat kernel). for x≥0, where erf() is the error function. 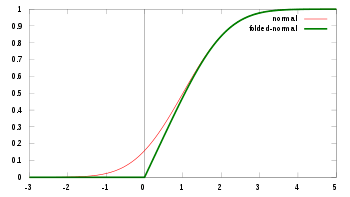 This expression reduces to the CDF of the half-normal distribution when μ = 0. 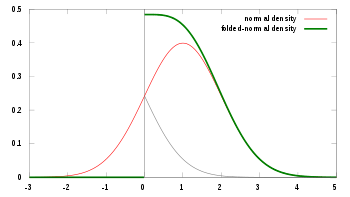 Both the mean (μ) and variance (σ2) of X in the original normal distribution can be interpreted as the location and scale parameters of Y in the folded distribution. Tsagris et al. (2014) saw from numerical investigation that when , the maximum is met when , and when becomes greater than , the maximum approaches . This is of course something to be expected, since, in this case, the folded normal converges to the normal distribution. In order to avoid any trouble with negative variances, the exponentiation of the parameter is suggested. Alternatively, you can add a constraint, such as if the optimiser goes for a negative variance the value of the log-likelihood is NA or something very small. It becomes clear that the optimization the log-likelihood with respect to the two parameters has turned into a root search of a function. This of course is identical to the previous root search. Tsagris et al. (2014) spotted that there are three roots to this equation for , i.e. there are three possible values of that satisfy this equation. The and , which are the maximum likelihood estimates and 0, which corresponds to the minimum log-likelihood. When μ = 0, the distribution of Y is a half-normal distribution. The random variable (Y/σ)2 has a noncentral chi-squared distribution with 1 degree of freedom and noncentrality equal to (μ/σ)2. The folded normal distribution can also be seen as the limit of the folded non-standardized t distribution as the degrees of freedom go to infinity. There is a bivariate version developed by Psarakis and Panaretos (2001) as well as a multivariate version developed by Chakraborty and Moutushi (2013). Tsagris M., Beneki C. and Hassani H. (2014) "On the folded normal distribution." Mathematics 2 (1): 12-28. Leone FC, Nottingham RB, Nelson LS (1961). "The Folded Normal Distribution". Technometrics. Technometrics, Vol. 3, No. 4. 3 (4): 543–550. doi:10.2307/1266560. JSTOR 1266560. Johnson NL (1962). "The folded normal distribution: accuracy of the estimation by maximum likelihood". Technometrics. Technometrics, Vol. 4, No. 2. 4 (2): 249–256. doi:10.2307/1266622. JSTOR 1266622. Nelson LS (1980). "The Folded Normal Distribution". J Qual Technol. 12 (4): 236–238. Elandt RC (1961). "The folded normal distribution: two methods of estimating parameters from moments". Technometrics. Technometrics, Vol. 3, No. 4. 3 (4): 551–562. doi:10.2307/1266561. JSTOR 1266561. Lin PC (2005). "Application of the generalized folded-normal distribution to the process capability measures". Int J Adv Manuf Technol. 26 (7–8): 825–830. doi:10.1007/s00170-003-2043-x. Psarakis S. and Panaretos J. (1990). "The folded t distribution. "Communications in Statistics-Theory and Methods 19 (7): 2717-2734. Psarakis S. and Panaretos J. (2001). "On some bivariate extensions of the folded normal and the folded-t distributions." Journal of Applied Statistical Science 10 (2): 119-136. Chakraborty A. K. and Moutushi C. (2013). "On multivariate folded normal distribution." Sankhya B 75 (1): 1-15.